Yesterday I finished up the paper pieced trees. The panels are not yet sewn together to allow for possible changes. Today I will begin the left side border after sewing down a hanging sleeve and label on another quilt. Early this morning I had a dental appointment and while driving to Uptown listened to Christmas music. Finally it's beginning to feel like Christmas with the temperature at 39 degrees and seeing the Christmas decorated store fronts, banks and street lined lights with wreaths and lights. 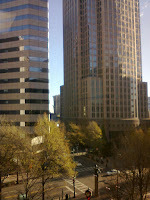 Uptown Charlotte is so full of life! I love the experience. Unfortunately, I didn’t capture the lights and decorations. I did get a shot from my dentist’s office 6 floors up overlooking Trade Street. Each corner has a statue. I was planning to go to Mary Jo’s Fabrics after my dentist appointment but our painter, who is painting the trim work on our house, called and said he was coming to finish. Yea! On that but Oh Well! on putting my trip off to Mary Jo’s Fabrics for another day. Mary Jo’s is a 32,000 square foot fabric and notion retail center is filled to capacity with wonderful fabrics and notions at bargain prices. When I go I plan to spend several hours. Maybe tomorrow instead. http://maryjos.com/ Bus loads of quilters come from various states to shop at Mary Jo’s. If you stop by my blog share what puts you in the Christmas spirit and whether you have begun shopping or making that special gift from your sewing studio? Added music to make it more festive!